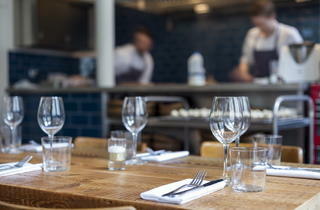 In hippest Shoreditch, a no-choice, daily-changing menu of nine cutting-edge-modern dishes that look absolutely ravishing. 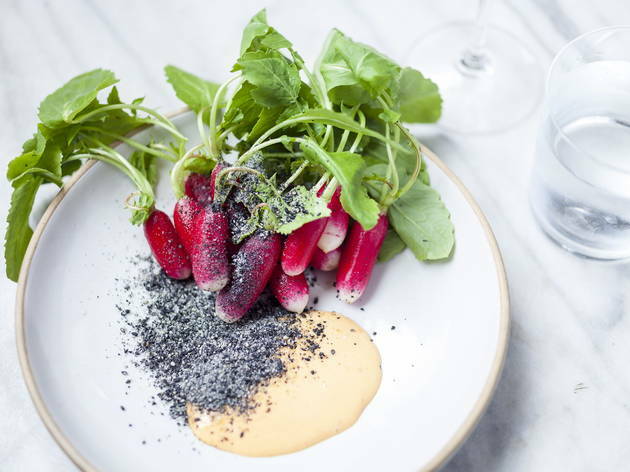 It can sometimes be hard to know if a restaurant is trying to make food that you will savour and enjoy, or is simply creating dishes to feed the Instagram craze. Taking no chances, Shoreditch’s Clove Club is doing both. The Clove Club’s menu is a masterpiece of contemporary aspirations. With a no-choice list of nine courses, there’s no possibility of a fashion faux pas when ordering. This daily-changing menu is economically worded. 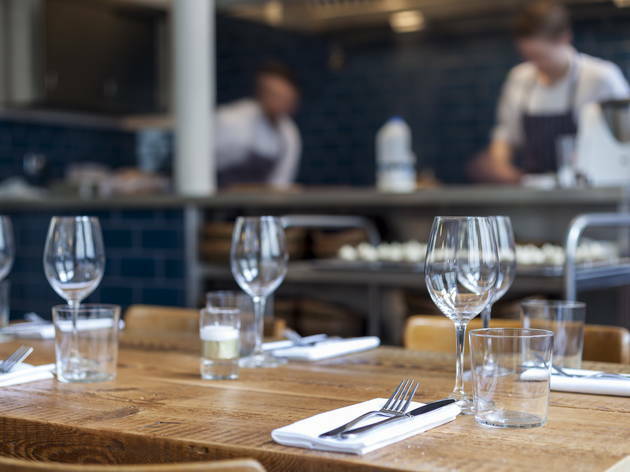 It describes a succession of small plates: dishes which are seasonal, that champion British produce, yet are oddly esoteric. It is both accessible and obscurantist. 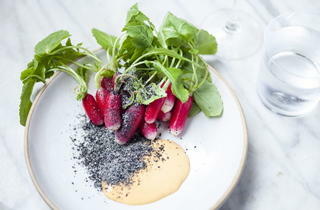 The menu’s ‘Radishes, sesame and gochuchang’ only contained gochuchang – a Korean chilli paste – as a slight pink tinge to a mayonnaise dip. Leeks were poached and slit, then smoked mussels were inserted like peas in a split pod. A spinach purée seeped from the side. The result looked disquieting, but will end up on lots of Pinterest boards. 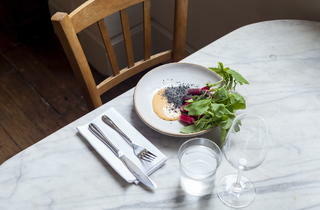 A pattern emerged: dishes seemed destined to be photographed and talked about, possibly more than savoured. The best dishes tended to be the ones that weren’t trying quite so hard to impress. A dish of Ruby Red beef, ramson and potato comprised a generous piece of slow-cooked beef, very tender and moist; the ramson (wild garlic) was barely discernable, but it helped tick the ‘seasonal’ and ‘wild’ boxes. Nine courses are a lot to get through, but the desserts might include another highlight: blood orange segments dried like prunes, then studded into a sheep’s milk mousse. Blood orange reappears in the same dish as a ‘fruit leather’ garnish, amid slivers of ewe’s milk cheese. 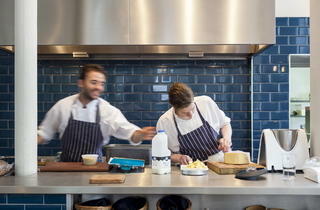 The Clove Club’s cooking is intentionally avant-garde. 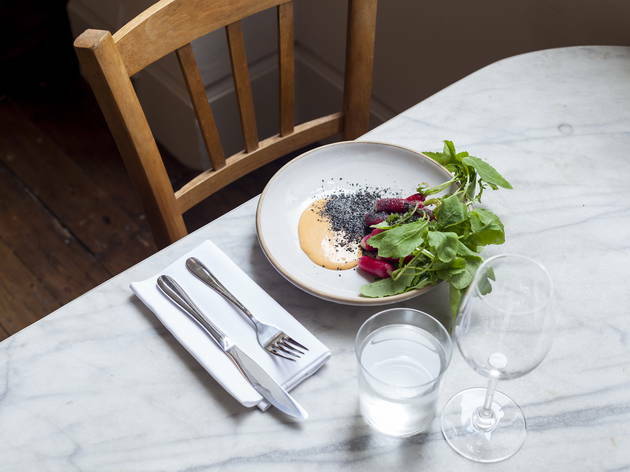 Everything about it screams ‘look at me’: the location, in the former Shoreditch Town Hall, the austerity of the décor, the open kitchen, and the other diners, many of them scenesters. Yet Clove Club is above parody, mainly because what it does, it does very well indeed. Take it with a pinch of artisanal salt, because it’s one of the restaurants that will define this year. 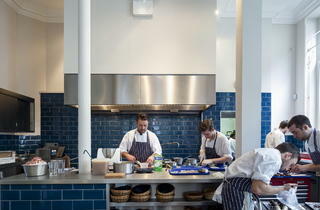 The menu has changed from 2 years ago, but overall still one of the best meals in London. The memorable “Pine-infused Fried Chicken” starter was as good as I remembered. Pictured here is the first course of “Hay Smoked Wiltshire Trout, Toasted Almonds & Brown Butter with Petrossian Caviar”. The fish was beautifully cooked although I am not a caviar fan. The new addition of “Spider Crab Risotto” was delicious and I wish there was more! Another highlight was the “Cornish Monkfish in Winter Herb Broth” which was so tender and full of flavour. Last but not least, the dessert of “Apple Tart Tartin” was absolutely perfect! Overall, the food was fantastic and the service attentive. Highly recommended despite he fact that you have to pay on reservation. As one of the three restaurants in London standing in the ranking of the top 50 best in the world in the 26th position, I definitely had to try it sooner or later, thankfully it was sooner. I booked 2 days in advance! For lunch which doesn't offer an A La Carthe menu but does offer the 5 or 9 tasting course menu. As I wanted the whole gastronomic experience I ordered the 9 course tasting menu, and sure it didn't disappoint. Each dish was presented creatively and beautifully. The taste was just as good and sometimes better than expected. I'm not going to talk about each dish because I'd be here all day. But I've got to admit,their unique combinations of ingredients, flavours and textures will surely take your palate into a whole new journey. It turns normal foods like tartar, scallops, duck, into a whole other different story, which in the end creates a delightful novel of original dishes. I was not nearly disappointed by anything as each dish had its own personality, which was presented to you by friendly staff who are always there whenever you want to ask for something, but you won't because they will ask you before you even realize you need or want it. It is expensive but definitely worth every penny. This place is a must in London and as soon as you try it you will see why it is one of the worlds best. Recommended at its best. That night felt like Christmas, having to pre book 2 months in advance , I was counting the days to this dinner at the now famous Clove Club. After receiving many awards and featuring on so many top restaurants list, I was very excited to experience it myself. And boy it did not disappoint! The service is impeccable , you could think the staff would be very uptight and severe in this kind of establishment, but it isn't , it is very friendly, knowledgable and makes you feel welcome and relaxed from start to finish. Kudos to the outstanding sommelier and fantastic wine list. The food is superb, you can do the menu blind or see all the details beforehand. The food is superb , British influence with some detours in Japanese cuisine and techniques. 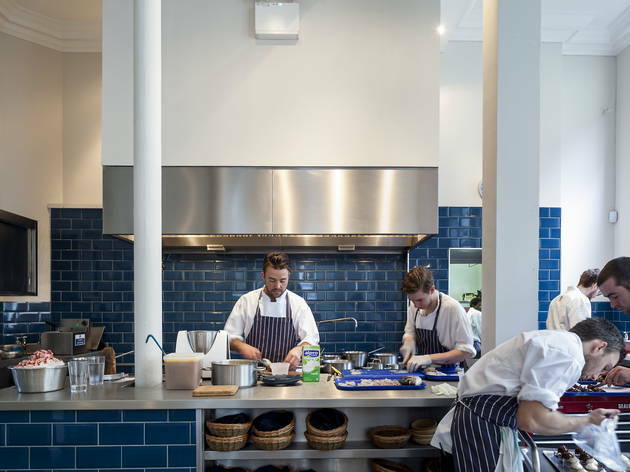 I won't spoil the fun of revealing too much the menu, but I had a delicious very green summer broth full of herbs and Cornish mussels, fabulous scallops with truffles, land a duck I will remember for years . The desserts don't leave you disappointed as well with audacious propositions like champagne jelly! 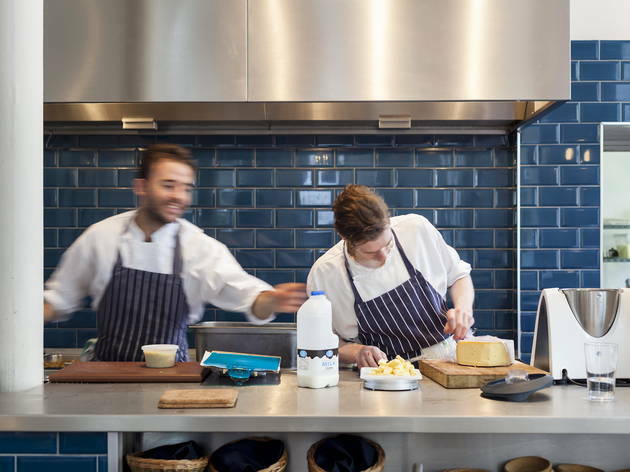 The setting is quite minimal , Scandinavian wood tables, open kitchen with bright blue tiles and the nice setting of Shoreditch Town Hall, the place is special on his own. This is a really outstanding restaurant ! Treat yourself for a special occasion, you won't be disappointed . Though situated in Shoreditch Town Hall, the space isn't altogether very inspiring. What the space lacks in imagination the food makes up for. Course upon course arrived (from the tasting menu) and all were delicious, imaginative and surprising dishes. I often find with a tasting menu the courses are too fiddly.These weren't and the portions sizes were bang on. Each course was introduced with care and attention from the waiting staff so we knew exactly what we were eating. And the same too with the matched wine. I would definitely recommend Clove Club. It's a beautiful tasting menu taken out of a stuffy overly formal dining environment. Outstanding experience. I'm not a great fan of having zero choice in what is served to me but every course was a taste experience and delicious. The courses were all excellent but sadly because of the delerium caused by the rich food I can't remember exactly what I ate apart from the oft referenced buttermilk chicken. The decor is basic but it works and to be fair fits in with the whole experience. The staff and service were excellent, friendly, knowledgeable and ever so cool (stylistically not off-hand) but my only comment was the wine list. I love wine and I'm sure it was curated to compliment the food but I felt it didn't accommodate my wants and tastes. Only a minor point but for me wine is as important as the food. I would love to go back any time. The food from our five course lunch tasting menu looked as good as it tasted. There is a certain charm about this place with its understated decor.